As far as venues go, there can’t be many as beautiful and as accommodating as the ranches where the US Optics Team Challenge was held. It has the beautiful mountainous backdrops, crisp, clean air, and still has enough open space and distances to facilitate a match of this type and others that Competition Dynamics hosts on site. Competition Dynamics refers to the US Optics Team Challenge as a “tough team match”. After having shot the match, I do believe that to be an apt description of the event. As the name implies, this was a team event. There were 35 two-man teams. In this event, one man is designated the “rifle shooter” and the other the “carbine shooter”. My teammate, Collin Fossen, was the rifle shooter and I carried the carbine for the entirety of the match. I didn’t exactly know what to expect when I agreed to shoot with Collin. I did know that the stages or “courses” were going to be timed, unlike most matches I have shot previously where each individual stage was timed and the movement in between was at a more leisurely pace. In the mornings each team had a scheduled start time for what are called “field courses”. I believe the first and most difficult field course we ran was almost 3 miles if I’m not mistaken. Some of the positions were at the top of some rather steep inclines with the terrain being semi-rough with rocks and grass clumps, and even the portions where we could trek up a county road were rather steep. For some people it may not be a big deal, but I wasn’t exactly at the pinnacle of physical fitness and I do live in the flatlands, after all. So hiking is something I’m not very accustomed to. I definitely was out of my comfort zone, but I must admit I was still having fun. Collin is in excellent shape and more accustomed to the terrain, so he was typically waiting for me for a short while at each firing position ranging targets for me. Great teammate to have, right? We would have 60 minutes to do everything in the field courses, which includes moving between firing stations, identifying targets, ranging, and engaging. Teams that finished their courses early were given bonus points depending on how early they finished. Teams were started from the beginning of each course every 20 minutes. If the team behind you caught up to you at a station, you had to immediately move aside to allow that team to play-through while your time was still ticking, or choose to sprint ahead to the next station to make up time, giving up the targets you had just left behind. The winning teams in these types of events will not only be great shooters, but they will be in excellent shape. The top teams gained a lot of points by finishing early and catching competitors. We were never caught the whole weekend and we barely missed catching a team by thirty seconds or so. Even though I’m probably slower than most, we must have made up for it doing our shooting business quickly. At our scheduled time we would be told which direction to head out in and our time started. Once we reached each station the range officer would give a quick briefing on the current position, and allow you to start. All of the targets at this match were unknown distance. So, while on the clock team members must be identifying and ranging targets and preparing to shoot. This was also the first time I had been in the rush of doing all of those things against the clock, but I quickly got used to it as Collin is an expert when it comes to finding, identifying and ranging targets. The field courses were more rifle-heavy in that most of the emphasis of the stations were more laid out for the precision rifle. So typically the carbine shooter would first engage something like 5 of 10 targets (any that he chose to engage) and then the rifle shooter would engage the same array of 10 targets. The carbine shooter could shoot unlimited times and the rifle shooter only once per target. Theoretically, the team shouldn’t drop any carbine targets for the match, but sometimes we just couldn’t get a round on steel and had to move on for time’s sake or because we were running low on ammunition. The field courses continued this way each morning for all 3 days of the match. With a short lull in the mid-day, we would then be scheduled for what are called “assault courses” in the afternoons. The assault courses were much shorter in distance and were much faster. So we could do several assault courses each afternoon. They were setup much more similarly to “3 gun” type stages. 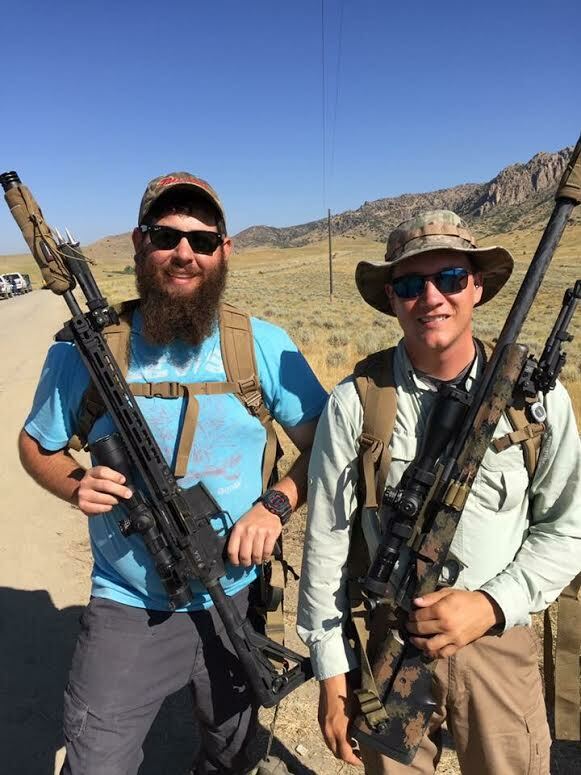 There may be a couple hundred yards of movement, and the team would typically both shoot a pistol briefly, and then the carbine shooter had to do quite a bit of work. Sometimes there would be IPSC cardboard silhouettes, or closer steel targets. It had a “run and gun” feel to it, which I enjoy. I’ve done quite a bit of 3-gun shooting in local monthly matches over the past 2 years and I feel that helped our overall score quite a bit by the end of the match since we were used to that type of shooting and stage-planning. Since Collin also competes in local 3-gun matches so we were on the same page there. I heard small complaints from other competitors and friends that the assault courses should have had more rifle engagements, but I disagree as I feel the spirit of those was more about speed and bursts of movement. I don’t have many complaints about the experience of the match. My biggest complaint would probably be about myself not being in as good of shape as I should have been, and I’m sure Collin would agree. But I had a great feeling of accomplishment and confidence after finishing the match in the top 50%, and not having been caught by other competitors during the course. The prize table at the match was huge. I heard something like $45,000 worth of prizes was on the table and that may be conservative. That’s excellent. Collin and I ended up in 15th place. We both walked away with at least $500 worth of prizes and that didn’t include the match swag we received from US Optics before the match. One aspect of these shooting matches that gets overlooked a lot of the time is management and staffing. I was blown away at how smoothly this match was conducted. Everything was on a nice schedule so nothing was thrown out to caution. All of the range officers were actual staff or volunteers with match experience. That meant that there were no bumbling, nervous RO’s making mistakes or headaches on score sheets and the like. All of the staff had radios and great communication. From the customer’s point of view, I didn’t see any major issues with what was going on. They were just all buzzing in the background on ATV’s making things happen, and that all added up to an excellent match and match experience. When I had first signed up, I thought $300 per competitor was a little steep for an entry fee. But now I see that those entry fees are not wasted and I was not bothered by it after seeing what it was all about. I’m really glad Collin gave me the invite. He is an excellent shooter and was definitely taking on a less experienced shooter in me but he was a great teammate and taught me quite a bit that weekend. He has won the Team Steel Safari, and recently won the Nightforce 2 Rifle match in Raton, NM just a couple of weeks after our team match. I foresee him being near the top of the podium in the matches he enters in the coming seasons. I had a great time at this match, and I learned more than I had expected. I will definitely do this match again in the future, and I really want to try one of the Steel Safari matches, which is also put on by Competition Dynamics.